This morning during the balancing sequence, our yoga instructor challenged us to try something new. I've heard her talk about pushing our practice, and I really do try to do different things. Close my eyes during tree pose? yes. Wave my arms around? Sure. See if I can wobble my way into a balanced bind? Got this. 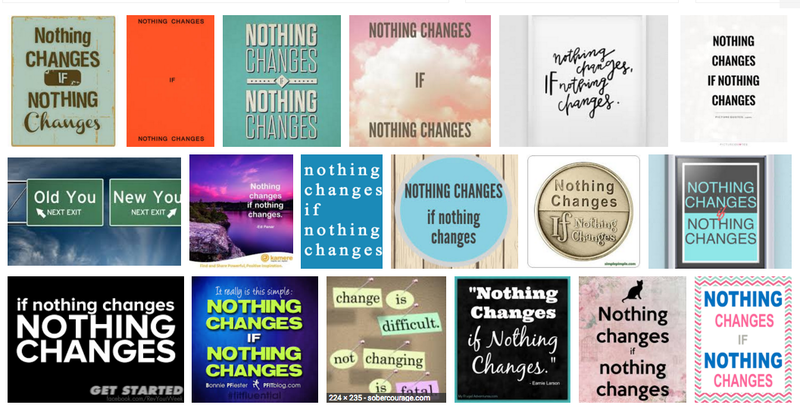 One of our instructors from another studio used to say that nothing changes if nothing changes. In yoga, I can do the same things the same way week in and week out, but unless I push myself to lean back a little farther, twist a little deeper, stretch a little harder, I stay about the same. Sometimes the changes happen so incrementally that it's hard to know I've made progress, but then I remember there was a time I winced when instructed to do the gorilla pose. There was a time when camel was an impossibility. Oh yeah. I can do those now. I actually liked standing on my hands in gorilla today. This is so true in learning as well. Maybe it's true for everything. Totally what I needed and yes! True in everything. My pal and I like to say "Evolve or die." A little dramatic, but gets the point across. Thanks for the post. Oh, this is SO true. 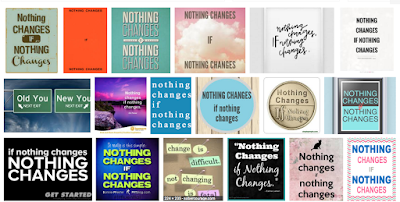 Nothing changes idea nothing changes. I saved your screen shot. I'm hinting of making it my wallpaper. What an inspiring and wonderful reminder that we are all capable of change and facing that change with open minds and hearts. I'm also looking forward to mastering the gorilla pose in yoga! Five simple words, but yet so much to think about. I need to keep these words in mind. Interesting that with yoga comes lessons for life. How I love being on my yoga mat. It has been far too long. Thank you for the inspiration. Nothing does change, if nothing changes. The mat will not come to me. Must make plans.